The dystopian genre was created by George Orwell and Yevgeny Zamyatin to sharply criticize the existing social and political orders. However, the bite of a classic like Vladimir Voinovich’s Moscow 2042 is largely lost in the current Divergent Maze Game craze of teen dystopian thriller-romances. Instead, the conflict largely boils down to a struggle between the young and pretty versus the old and mean. 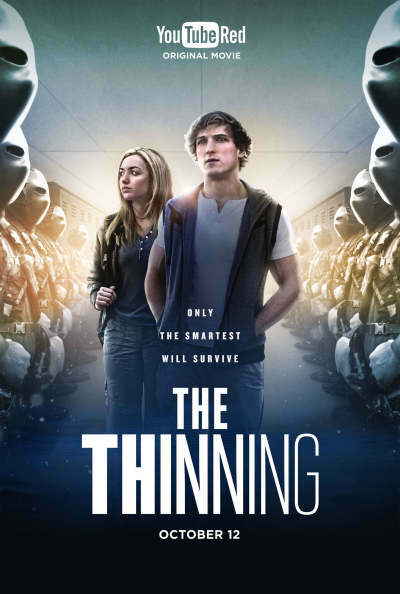 YouTube Red continues the tradition of mushy ideology, but rather shrewdly taps into the anxiety surrounding standardized testing in their first original feature, Michael J. Gallagher’s The Thinning (trailer here), which premieres on the subscriber platform this Wednesday. At the behest of the United Nations, every member country agreed to cut their populations by five percent to prevent over-population and natural resource depletion. Since regard for the UN is highest in the great state of Texas, Gov. Dean Redding has been particularly proactive in culling the populace. Under his watch, the state instituted the Thinning, a standardized test administered throughout elementary, middle and high schools, in which the lowest scoring students are euthanized. It might sound rather novel to find any government program based solely on merit, but of course there will be exceptions. Laina Michaels is poor, but brilliant so she has nothing to fear from the Thinning, right? She has long carried a torch for her classmate Blake Redding, the governor’s son, who is obviously privileged, but probably smart enough to make it through the Thinning. However, when his black sheep girlfriend falls victim to their junior year Thinning, Redding decides to deliberately fail in order to embarrass his father and hopefully force him to institute humane reforms. Unfortunately, Redding and Michaels finish their exams at precisely the same time, so the governor’s enforcer simply switches the results. Naturally, Redding is rather put out by this turn of events and Michaels is even less amused. Soon they team up to hunt for evidence of corruption, with the secret assistance of Michaels’ loyal teacher. It is probably no accident that Thinning is set in Texas or that actor Matthew Glave bears a resemblance to former Governor Rick Perry, but it is rather silly to suggest the sprawling state of Texas would be soon concerned with population control. Indeed, Gallagher and co-screenwriter Steve Greene engage in massive transference imposing the fear of over-population, an almost entirely leftwing obsession shared by the likes of Warren Buffet and Ted Turner, on the starboard side of the spectrum (better exemplified by anti-Malthusian economist Julian Simon) and then demonize them for employing police state tactics. On the other hand, Thinning features Fox News commentator and Clueless co-star Stacey Dash as Michaels’ heroic teacher (a forceful presence), so that is almost enough to balance it out right there. Presumably, she has sky high social media metrics, which seems to be the primary casting criteria for YouTube Red productions. Established TV star Peyton List is also reasonably charismatic as Michaels, whereas Logan Paul’s Redding largely comes off as a knucklehead, but that is what the role requires. To give credit where it is due, Glave makes an entertainingly Machiavellian villain as the exterminator-governator. You have seen everything in Thinning previously several times over in innumerable dyspeptic dystopian melodramas. Yet, the final conclusions rather insidiously leaves viewers primed for an equally middling sequel. At least it has the virtue of brevity (as well as Dash). If you enjoy rolling your eyes at clichés than it might be worth watching, but it hardly justifies the ten buck monthly subscription fee (which also includes Google Play). Regardless, The Thinning fights the future this Wednesday (10/12) on YouTube Red.